Stephanie Thornton: Super Sweet Award! 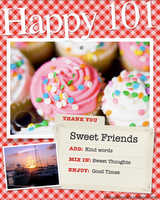 In the past couple days, both Amalia and Deb@RGRamblings have awarded me this super-yummy Happy 101 award. I'm going to copy Deb (because she's a genius) and award this to bloggers who remind me of my favorite things. I'm also going to attempt to give this to people I haven't given awards to before- my favorite thing about awards is that it can bring attention to blogs you may never have found otherwise. This is a no pressure award- feel free to acknowledge, pass on, or not! The rules are that you have list ten things that make you happy and give the award to 10 recipients. For once, I'm going to attempt to follow the rules. 1. Flowers. I love growing them and right now I have a month to wait before I can plant seeds indoors. I have an Amaryllis blooming and some Narcissi sprouted inside. I need more! Jemi at Just Jemi has a lovely flower as her profile picture. Her posts are always good for a smile! 2. My daughter. No one could have prepared me for the love I'd feel for the little monkey. There's something special and indefinable about a mother's love. Natalie Bahm did a series of posts a while back on what her kids had taught her about writing. They were some of my favorite blog posts ever. 3. History. I am a total history nerd. I remember watching a movie in 1st grade on the Titanic and being mesmerized by the underwater footage of a barnacle-encrusted chandelier. That kind of stuff just captures my imagination. Gary Corby at A Dead Man Fell From the Sky has an awesome blog, mostly focusing on ancient Greece. He also recently pointed me in the direction of The History Blog which has super-cool articles about all sorts of history. 4. Art. Charcoal, watercolor, acrylic, photography, pottery... I love it all and wish I was better at it. Ann Foxlee is a writer inspired by art. She has a cool contest going on that I shouldn't tell you about because I really want to win a print of the third picture she has listed. But you should check it out! 5. Travel. I love to travel. I've hit Egypt, France, Italy, Britain, Ireland, Jordan, Greece, Turkey, the Czech Republic, and a whole lot other countries. I want to go to Morocco, Peru, and Cambodia next. But not in the same trip. Valerie Geary at Something to Write About is doing her month-long genre focus on travel literature. She's like the Travelocity gnome, only not weird. 6. Poetry. I'm not very good at it, but I love to read it. My favorite part of writing is metaphor and hyperbole. Good poetry is often one big metaphor. Tricia O'Brien at Talespinning writes wonderful poetry. I always know when clicking on her blog that it's going to be a beautiful post. 7. Sunshine. So I live in the wrong state for this since Alaska is immersed in darkness a couple months a year and it makes me want to go banana bonkers from November to February. When the sun is out I soak it up. Steph Damore is like liquid sunshine, only on my computer screen. Okay, that metaphor doesn't make sense, but you get what I mean. 8. Books. I've read four already this year and am poised to finish another tonight. I'm not officially participating in the 100 Books a Year challenge, but I hope I can reach that number. Shannon O'Donnell at Bookdreaming is an awesome blogger with great taste in books. Okey dokey. That's 8 things I love and 9 bloggers. I also love yoga and chocolate covered pretzels, but I don't know any bloggers who blog about those. I'm not good at math, but I'm going to round up and call that an even 10. Enjoy those cupcakes!